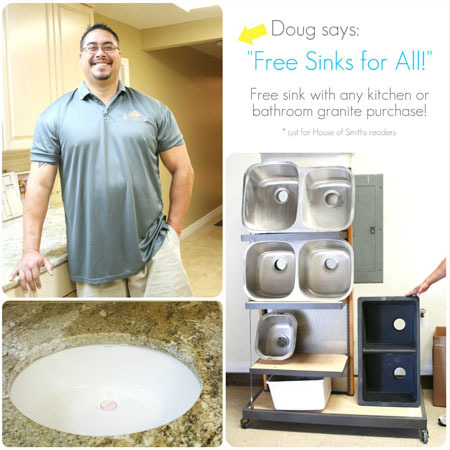 Granite City: Discount Granite & FREE Sinks! "What granite yard did you go to, to get your discounted granite from, for your bathroom vanity counter top?" 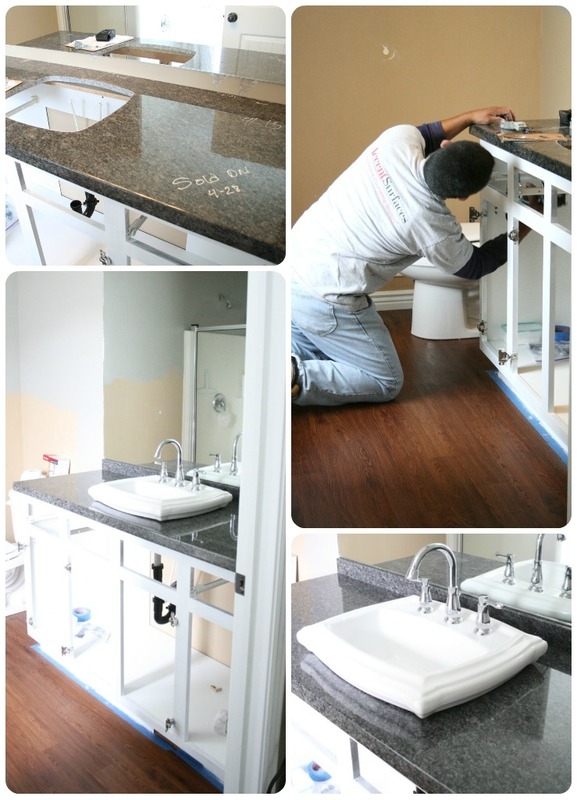 We knew that when we started to re-haul the bathroom, we wanted to switch out our counter top. You can read more about that here. 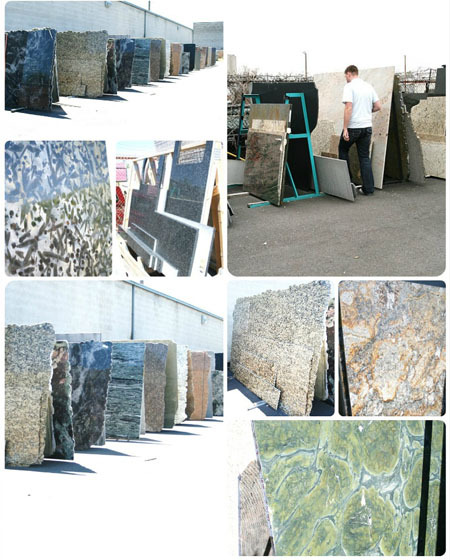 So we went searching for discounted granite near our home, and stumbled onto Granite City. We have worked directly with Doug, who is in charge of retail sales. He has been amazing through the entire process. From finding a piece of remnant granite from his yard, in the color we wanted, to checking up on us after the installation was made! 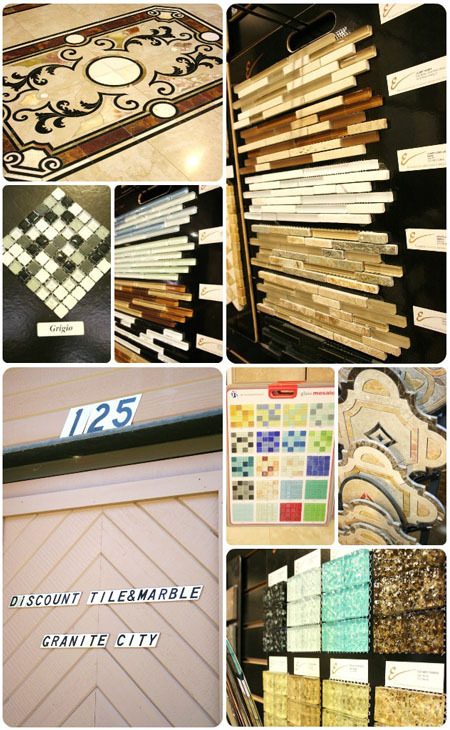 Can I tell you that I never thought that walking into a discount tile, wood, carpet, and granite showroom would bring me so much happiness??? ha! 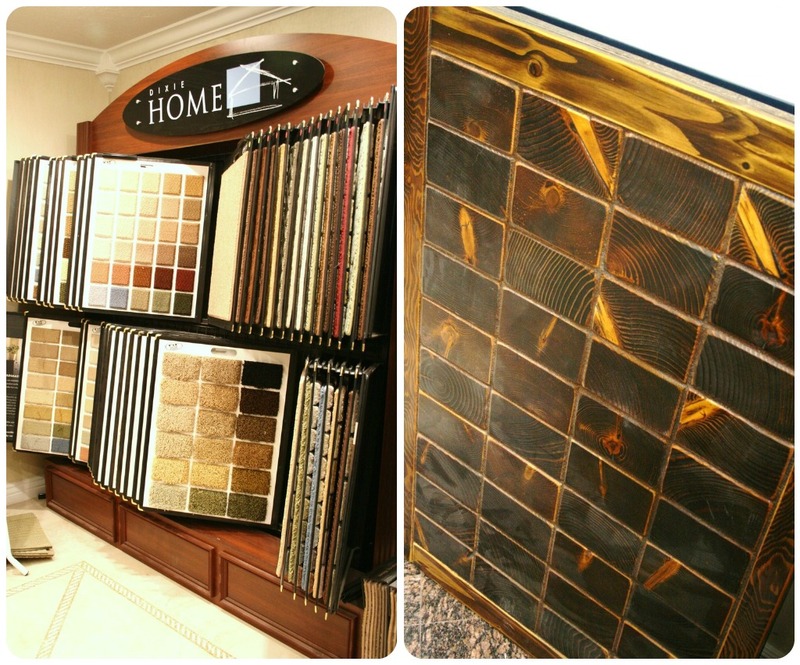 Honestly, Doug and his crew have EVERY material that you can think of, for your next big (or small) house project! Granite City also has an (almost ridiculous) amount of carpet samples, and other unique flooring. No. But really. We're talking 4 rooms full! They aren't messin' around. If you can't find what you're looking for there, you're probably NOT going to find it. I even found a great sample of some high traffic carpet that I'm thinking of putting in just our front room, under our new rug, because the existing carpet is SO worn out, due to all the foot traffic. Check it out! 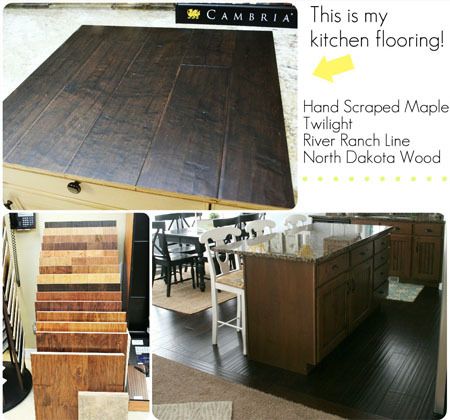 I even found the exact sample there, of my kitchen flooring, that everyone is always asking me about! 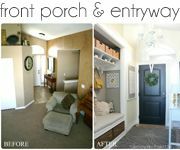 Yes, I LOVE that dark wood floor :) It may be a little bit harder to keep clean, but the look is amazing, makes such a statement in a room, and goes with EVERY color and style! Okay, okay, back to the granite. This is the indoor showroom at Granite City. I think that the thing I love most about this area, is that it's totally hands on. 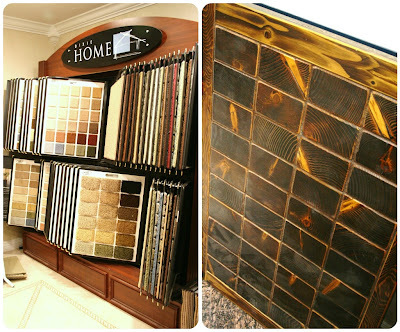 You can touch, feel, compare, and even take home samples of granite colors, tiles, and other materials that you are thinking of using for your next project. I LOVE THAT! No guessing. Well, he told me to tell all of YOU, that he was so thrilled to have you guys visit, that if you do come and purchase some granite, for your next big home project, that he'll throw in a free sink! HELLO! Free stuff!? Yes please. Oh and also, I forgot to mention something else I loved. 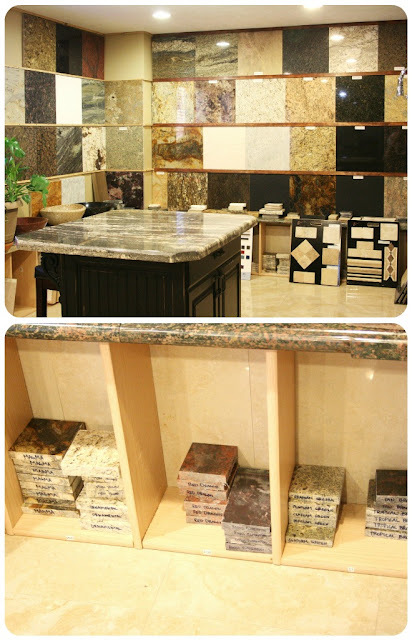 The granite prices INCLUDE installation as well. And the Granite City install guys were in and out of my house in only about an hour! Super quick, quality service. 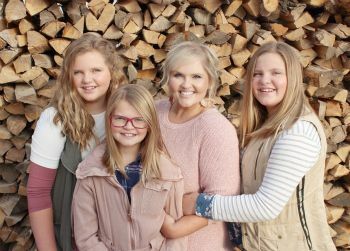 I have to admit, that Cason and I were a bit intimidated when starting our granite search because we were so unsure about what we wanted and how we were going to do it within our budget. And now?... We're looking through the sample magazines that Doug gave us, nightly, to figure out what our NEXT tile, carpet, or wood flooring project will be. ha! To me, I feel that that's how you know you've got great customer service. When the people who you do business with can enthusiastically share with you their expertise and their products, to keep your latest DIY projects moving along the right path. love the granite...wonder if there is a place that good near me??!! the hardwood you have is gorgeous!! okay i want that FLOORING! it's gorgeous! so jealous! Wow, where's this place?! I need one by me! Love your dark hardwood, it's so beautiful. I'm loving that I clicked on this today! We just had granite put into our kitchen this week. It is gorgeous and we want to tap dance on it. Towards the end of the process the lady from the granite place told us that we have enough left over to do the front bathroom. I wouldn't choose the same thing for a bathroom so she says we can have the same amount of anything she has! Woo hoo. :) Now I have another project. 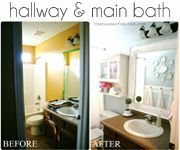 I love the bathroom picture have shown above. That sink is fabulous. 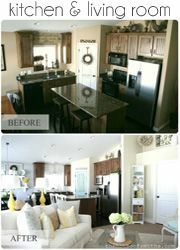 I was just looking at your blog and came across this post, we just remodeled our kitchen and Granite City did my countertops also. They did an amazing job and Doug was wonderful to work with. 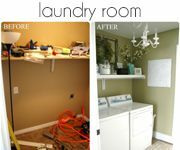 If you'd like I could send you some pictures of my kitchen transformation. My cabinet maker did an amazing job also. I absolutely love your bathroom. Such a great job. Can you please please tell me the name of the sink that you used. I know you said Villeroy Boch, but does it have a name or number as well. I love it and can't find anything like it.